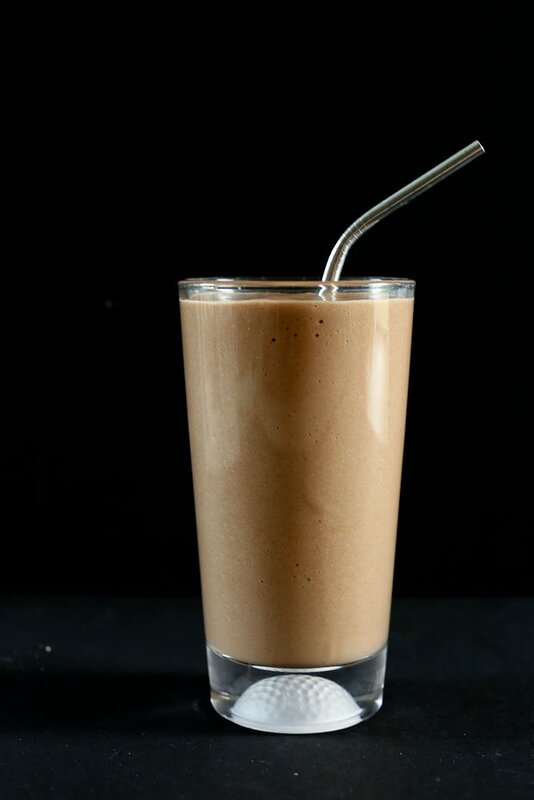 This Café Mocha Collagen Protein Smoothie has 24 grams of protein and 0 grams of added sugar! This post is sponsored by Bulletproof. All opinions are my own. I like to think of marriage as a give and take. You’ve got to have an equal amount of giving and taking to make things work. When it came to health and nutritional advice, I was always the giver and Tim the taker. Lately, there’s been a shift. He’s starting to give as much as take when it comes to nutritional advice. He’s been open-minded, learning and sharing new things, and it’s been pretty exciting for me. I love that he’s taken a stronger interest in something that’s been a passion of mine for a long time. It was actually Tim who created this Café Mocha Collagen Protein Smoothie. He’s been working to create breakfasts and snacks that have a good amount of protein, are lower in sugar or sugar-free, and are nutrient-dense. Collagen protein has been his favorite way to achieve that. Collagen protein is more than just protein. I’ve never been big on protein powders, actually. But collagen is different and brings so much nutrition to the table. 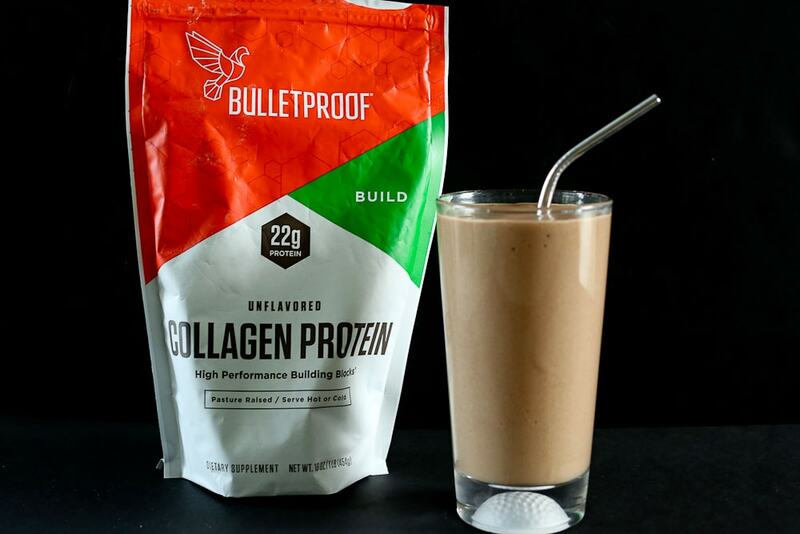 Let me tell you why we’ve been loving Bulletproof Collagen Protein. What are the benefits of collagen protein? Collagen is great for your joints. It promotes resilient, flexible joints. It helps reduce wrinkles and stretch marks. Collagen is known to give skin a healthy glow and promote radiance. 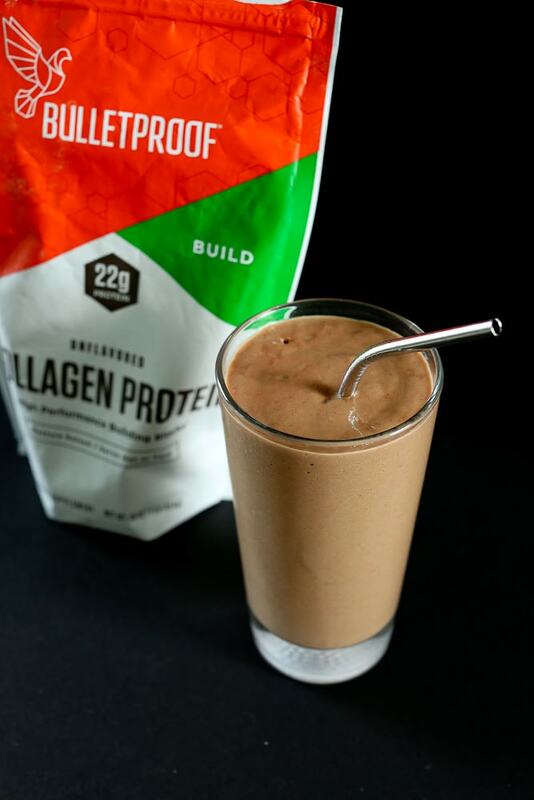 I like to think of adding Bulletproof Collagen Protein to my smoothies as my own personal anti-aging regimen! Traditionally, people would get collagen in their diets by through foods like bone broth, slow-cooked organ meats, kidney pies, baked beef hearts, whole crustaceans, and whole fish soups and stews. Sound like a diet you’re eating on a regular basis? No, me neither. That’s where collagen protein powder comes in. It’s an easier, more realistic way to get all the benefits on collagen on an everyday basis. 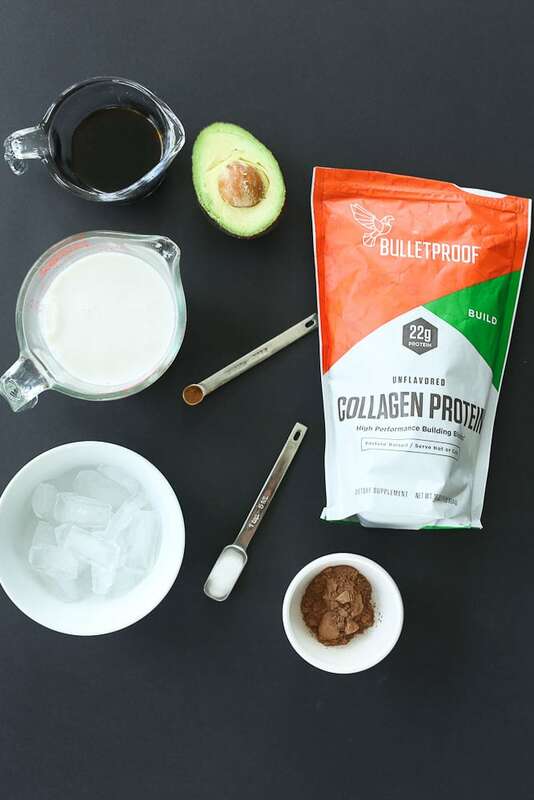 It’s really easy to use Bulletproof Collagen powder everyday because of special enzymatic processing, it doesn’t clump, and mixes invisibly in your favorite smoothies – or even plain water. Plus, because collagen is flavorless and more heat-stable than whey you can even mix it into your coffee (or any other hot beverage) without hurting its nutritional quality, or the taste. Speaking of whey, you may be wondering what the main differences are between collagen protein and whey. One of the biggest differences between collagen and whey is in the amino acids: Collagen is high in glycine – this is an amino acid that combines with glutamine and cysteine to support the production of glutathione, your body’s master antioxidant. Good stuff! It also has half of a large avocado for tons of nutrition, including healthy fat and instant creaminess. Raw cacao powder provides our chocolate flavor, and then we have unsweetened almond milk, a dash of cinnamon, and stevia for a little sweetness without adding sugar. This is not a super-sweet-dessert-like smoothie. If you are looking for a smoothie that tastes more like a chocolate milkshake, try adding some honey or maple syrup to amp up the sweet factor. Otherwise, appreciate this for what it is. It’s a lightly sweet, nutritional powerhouse of a smoothie that provides 22 grams of protein! If you’re ready to start adding collagen to your diet, Bulletproof Collagen Protein Powder is a great choice. The collagen comes from pasture-raised cows and you can purchase it online here. This Café Mocha Collagen Protein Smoothie has no added sugar, is low in net carbs, and is a healthy way to start your day! 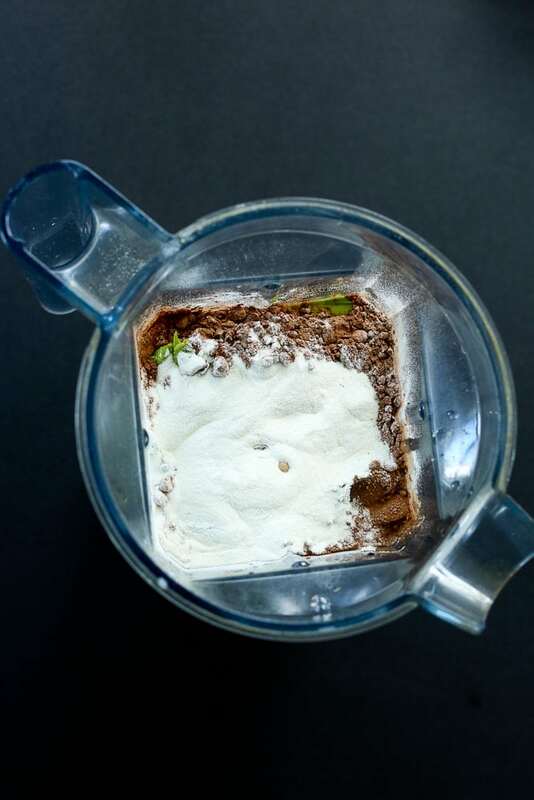 Place all ingredients in the blender and blend until super smooth. Enjoy! 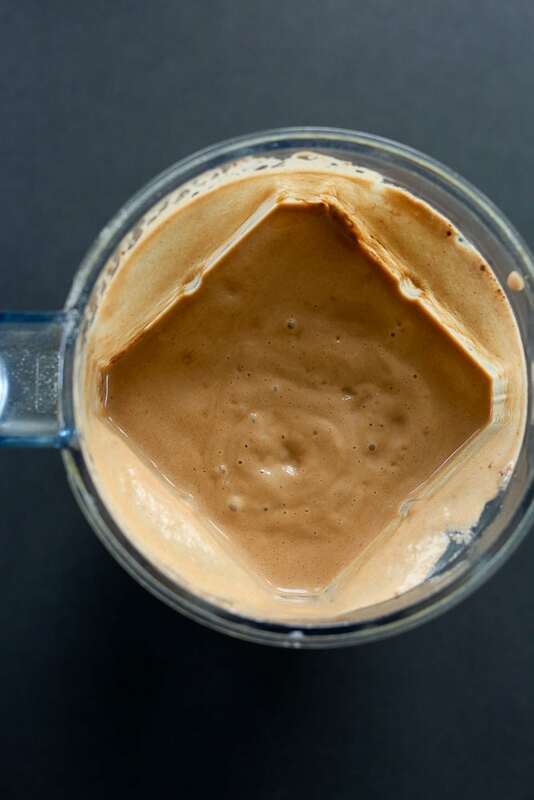 If you make this Café Mocha Collagen Protein Smoothie recipe, or any Happy Healthy Mama recipe, I would LOVE to see it! Please take a pic and share it on Instagram or the Happy Healthy Mama Facebook page and tag me @happyhealthymama ? I am so glad you shared this cafe mocha collagen protein smoothie recipe. It’s perfect because I can drink this on the go or while I’m doing sprinkler repair. Anything mocha flavored is delicious to me.